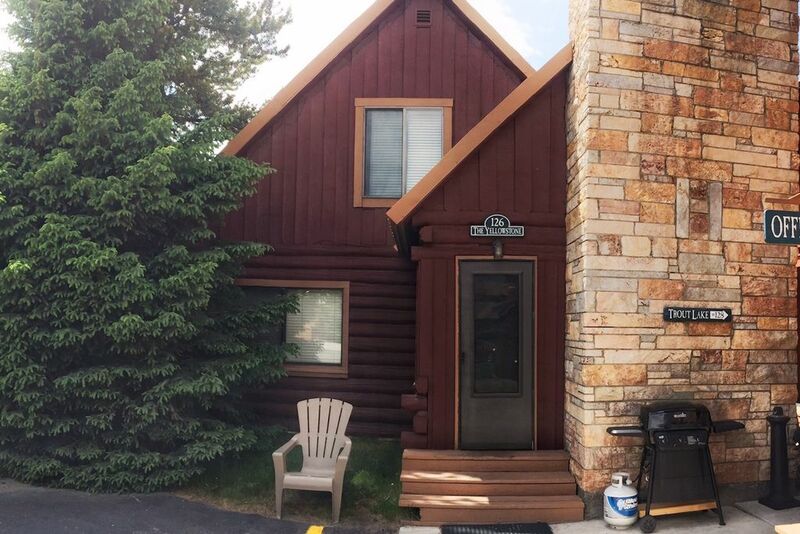 With recent updates in 2015, the Yellowstone Cabin 126 has 3 bedrooms, 2 full bathrooms, a fully-equipped kitchen, and a living room with fireplace. This cabin sleeps up to 10 and is a great value for small families and close-knit groups. The first level of this authentic log cabin has a spacious living room with a fireplace, flat screen satellite TV with DVD player, and cozy furnishings. You will also find a fully-equipped kitchen and dining area with a stove/oven, dishwasher, microwave, coffee maker, toaster, and a generous supply of dishes, silverware, cookware, and pots and pans. The large dining table seats 6 to 8 and there are 4 additional chairs at a side counter. Off the kitchen is a full bathroom stocked with plenty of towels that connects to one bedroom with a queen and a full bed fully made up with linens. One other bedroom on this floor has a queen and a twin bed also made up with linens, and there are a few extra pillows and blankets to go around. A quaint staircase leads upstairs to a a master suite with a fully made up king and a twin bed, ample closet space, and a master bathroom with a large soaking tub, shower, and double sinks. The cabin is heated throughout with a central gas furnace. Out front in the summer months, you will find a propane grill for barbecuing those fresh trout you caught in one of the area streams. Propane and basic grilling utensils are provided. PROVIDED: Liquid hand soap at all sinks. Towels, liquid dish soap, dishwasher pods, salt, pepper, ground coffee from Morning Glory Coffee & Tea, and coffee filters in the kitchen. Hair dryer, toilet paper, and towels in each bathroom. Full linens plus extra blankets and pillows. Free off-street parking (no RVs) and free wifi. NOT PROVIDED: Paper towels, plastic wrap or foil, sugar or spices, tea, toiletries. Our cabins do not have phones so please bring your cell phone. Daily housekeeping. We have a small coin-op guest laundry on-site with soap, dryer sheets, an iron and small ironing board provided. PLEASE NOTE: For cancellations received more than 60 days before arrival, we retain a fee of 10% of the total lodging cost. Refer to our Rates section for additional details. We recommend you purchase travel insurance to cover cancellations due to unexpected life events. The Yellowstone Cabin is one of 9 cabins at the Faithful Street Inn located on 3 adjoining city lots in West Yellowstone, Montana. We are in a quiet residential area just 6 blocks from the West Entrance to Yellowstone National Park and within walking distance to many shops, restaurants, a Giant Screen Theatre, the Grizzly and Wolf Discovery Center, and the Yellowstone Historic Center. We have two in-town grocery stores that have most of what you’ll need. We offer clean quality lodging to friends, families, and small groups traveling together visiting Yellowstone National Park and the greater Yellowstone area. We try our best to exceed your expectations! Of the 5 towns located just outside Yellowstone National Park, West Yellowstone, Montana, is the most centrally located for touring the park. We are just a one hour drive to Old Faithful Village and one and a half hour drive to the Grand Canyon of the Yellowstone. Yellowstone's boundary sits at the east side of town and we are surrounded by national forest on the other three sides. In winter, you can cross country ski or snowmobile right from town to several of the national forest trail systems. We are also close to several area rivers where you can fly fish or go white water rafting. We are the only locally-owned and operated vacation rental business in West Yellowstone, Montana, with an on-site office and a full time, year-round staff. Except for our two large cabins that sleep 18, our great housecleaning staff will change out your towels and provide more toilet paper as needed daily. Cross country ski trails located a couple of blocks from the cabin - snow permitting, ski right from the cabin to the trails. Thank you for your review of our authentic cabin here at Faithful Street Inn. We enjoyed having you and the opportunity to be a part of your snowmobile vacation and sincerely hope you will stay with us again. We take pride in the cleanliness of our cabins and we are currently planning some slight updates to all of our cabins and appreciate the feedback! Cabin was very clean and it worked perfect for the 10 of us. Cabin was perfect and everyone was super nice and helpful! We appreciate your great review and hope to see your family for a return trip! This cabin was great for our family of 9 (4 adults, 5 kids). There was plenty of room for everyone. We enjoyed playing games around the large kitchen table after spending a fun day in Yellowstone. It's close to the West entrance, which made it nice. We would stay here again! We appreciate your great review and welcome you back any time! Good for a large but close family. This is a very convenient property, close to restaurants and the park entrance. The upstairs master bathroom is dated, but all elements work fine. Stairs are quite steep though, you must take care coming down them! Kitchen is a wonderful large space -terrific for a large gathering or meal. Main level bedrooms are good. This property can sleep three (close-knit) families because if all the beds! Thanks for taking time to review The Yellowstone Cabin. As an authentic log cabin, we do our best to preserve its original character while still updating the interior to create a comfortable stay. We do appreciate your comments and will keep them in mind for future upgrades. Six of us stayed. Cabin is a little worn and dark- lights need updating, but very convenient to west entrance of park and can walk to restaurants and shops. Kitchen is well stocked. Thank you for writing a review. We appreciate your feedback and find all comments helpful as we continuously update our cabins. Everything went smoothly during our stay - the office staff was very kind and went above and beyond to accommodate some travelling mishaps. The bedrooms are large and there are enough beds for 10. We had a pack and play in one room as well. All appliances, heater, water heater were all operational and very comforting. We would definitely consider staying here again, but in a unit with a washer and dryer next time. We appreciate your review and are happy you enjoyed your stay. We do have three cabins with private laundries for future visits. This cabin is one of 9 at the Faithful Street Inn located on 3 adjoining city lots in the small town of West Yellowstone, Montana. We are in a quiet residential area just 6 blocks from the West Entrance to Yellowstone National Park and within walking distance to many shops, restaurants, a Giant Screen Theatre, the Grizzly and Wolf Discovery Center, and the Yellowstone Historic Center. We have two in-town grocery stores that have most of what you’ll need. Deposit/Cancellation Policy: 1/2 of the total charge is required to confirm your reservation. Final Payment is due 60 days before arrival date. Notice of cancellation of agreement is required 60 days prior to arrival. In the event Guest cancels a reservation 60 or more days prior to reserved date the deposit will be refunded, subject to a cancellation fee equal to 10% of total rent. If Guest requests cancellation of rental agreement within the 60 day time frame (60 days or less), owner will attempt to re-rent the property. If the property is re-rented for the amount of rents, the Deposit will be refunded, subject to a cancellation fee of 10% of the total rents. If the property is not re-rented to a third party, then the Guest will remain responsible for the full rental amount. No refunds for inclement weather, late arrivals, early departures, medical emergencies, or other circumstance beyond the control of the Owner. We recommend you purchase travel insurance to cover cancellations due to unexpected life events.